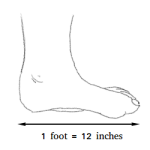 The median of a triangle is the line segment connecting the midpoint of a side and the opposite vertex. 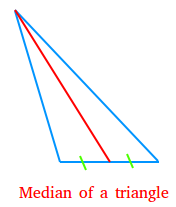 The median is shown for the triangle below with a red segment. The midpoint now creates two segments on that side. Notice the use of the green tick mark on the two segments. We use these tick marks to show that the segments are equal. Since the same amount of tick marks is used for both segments, then these two segments are equal. Since a triangle has three vertices, there will be three medians. 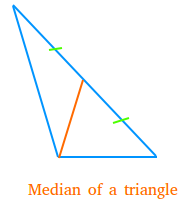 Here is another median shown with an orange line segment for the same triangle you see above.